What is the most common correction that you get in ballet class or on your competition critique? Chances are, it has something to do with your arms or shoulders. But how much time do you actually spend working on these corrections? When developing conditioning programs for dancers we tend to fall into the trap of working exclusively on our core, legs and feet but neglect to spend the appropriate time on our upper bodies (especially in girls). Dance is a full body activity. From the tips of your fingers and toes through to deep within your abdomen, everything gets used. But dancers often lack upper body strength. Why is this an issue you might ask? Yes, we rely on our lower body for most of the hard work to move us around the space, leap high into the air and work against great forces but our upper body is responsible for a lot that goes on as well. A turn cannot successfully be completed with droopy elbows, jumps will not get far off the ground if you are tensing your shoulders and neck mid-air and forget trying to perform contemporary floor work without stability through the shoulder-girdle. Dancers view their body as an instrument of expression and often they, along with their teachers and choreographers, have an unfounded fear that developing upper body strength will cause dancers to become “bulky” and therefore negatively affect aesthetic. In truth most females lack the body type required to develop bulky muscles so need not be worried about including upper body strength training into their conditioning programs. Addressing the real problem: It is not always inadequate strength that leads to shoulder injuries, but also poor form and lifting mechanics i.e. reduced control of the shoulders and their placement. Unlike the hip, which is a stable joint due to its shape and strong capsule, shoulders rely on the rotator cuff muscles to keep them stable. These muscles are located around the shoulder blade in your upper back and they work to hold the humerus (arm bone) in the gleniod fossa (shoulder socket). Without the appropriate strength, control and endurance in these muscles dancers are at risk of developing shoulder injuries. 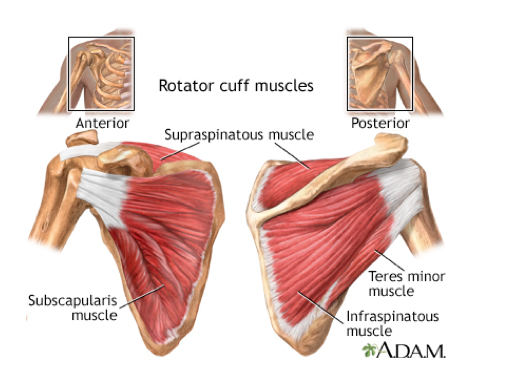 A strong rotator cuff allows arms to appear light and expressive but also stable for weight bearing during complex choreography, lifts and acrobatic work. Shoulders are a complex structure and can be difficult to train. Incorrect training is as much of an issue as not training. For younger dancers it is especially important to work with a knowledgeable health professional or coach who can guide you through correct technique and progressions to reduce the risk of injury. You will find that by incorporating some upper body strength and stability exercises into your conditioning programs your technique and expressive ability will significantly improve! In the video below, San Francisco Ballet Principal, Maria Kochetkova, demonstrates the strength and control required through the upper body when performing the famous 32 fouettés as seen in many of the great classical codas. With a technique and alignment as strong as this, the movement (almost) appears easy!